This warm and inviting winter vegetable ragout makes the perfect homely dinner guaranteed to keep you warm and toasty on a cold winter day. Serve this simple vegetable stew with a bottle of wine, a loaf of country bread, and a crisp, green salad for a complete meal. If you are wondering why this is called a ragout, be assured, it is not some complicated French recipe. A ragout is the French for a stew and, you must agree, sounds more sophisticated than a simple stew. They are, however, the same. This recipe list a range of seasonal winter vegetables which work well, you can, of course, use any you prefer, include all, or use a few. It is up to you. Put the carrots, butternut squash, red onions, cabbage, and turnips into a large roasting tin. Pour the olive oil over and toss the vegetables to make sure they are all covered. Generously season the vegetables with sea salt and pepper to taste and then pop into the center of the preheated oven. Roast uncovered, for 30 minutes or until they have started to caramelize slightly (but not burn, there is a difference, and it is mainly in the color which should be caramel not black and the smell, once you smell burning it is too far!. After the 30 minutes, add the vegetable stock, the white wine, tomatoes, into the vegetables and continue roasting them for a further 45 minutes to 1 hour, stirring occasionally. The vegetables will continue to cook and the sauce to thicken slightly. Check that all the vegetables are cooked through, if not continue to cook until they are. Taste and adjust the seasoning accordingly. Remove the tin from the oven and pour the contents into a casserole or warmed serving dish. Lightly sprinkle with the thyme and sage but be careful not to add too much, both herbs are quite overpowering. 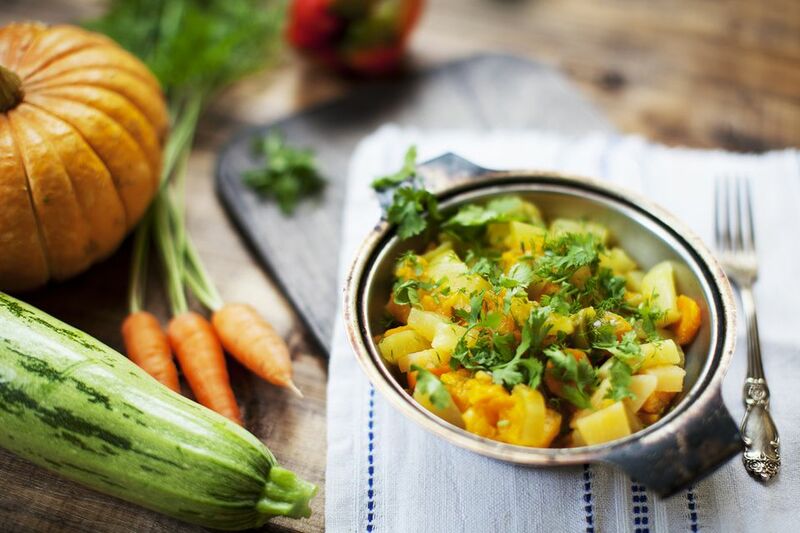 Serve the vegetable ragout with crusty baguette and butter for a fabulous vegetarian lunch or supper dish. The ragout can also be served as a side dish for those who prefer to eat meat or even fish by reducing the sauce down even further on the stove top by gently boiling for 5 - 10 minutes.